I'm a wreck. Floored. Gobsmacked. I feel like someone just punched me in the gut and backed over me with a car. Twice. 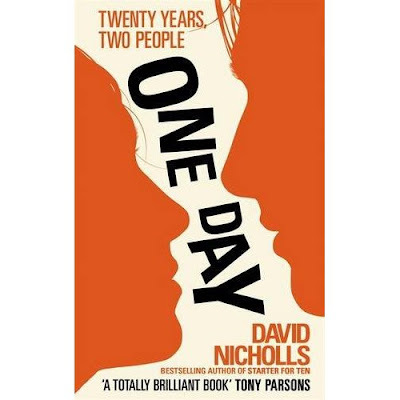 I just finished reading David Nicholls' One Day; and if the mark of a great book is that you have an emotional reaction to what you've read, it stays with you, and makes you question the very meaning of life, then this one is a classic. Unbelievably, this book is only available from the U.K. - I got mine from Amazon.co.uk after reading a great review in Uncut Magazine. I just ordered three more to distribute as Christmas gifts to people who don't read this blog (don't tell!). The book starts with a seemingly unpromising concept: we're to follow the lives of two students, Dex and Em, who meet on St. Swithin's Day (shout out to Billy Bragg!) and have a quick affair, as unpromising as the book's premise. Each chapter represents a one-year leap in Dex and Em's lives; they discover what we know from chapter one: they're in love and - no matter what happens - they will always be at their personal best when they're with each other, even when they're seeing other people, getting married to other people, and outright hating each other's guts. Sounds predictable, I know. Sounds sappy, I know. Sounds like a terrible Julia Roberts movie (Runaway Bride II? ), I know. Sounds like men need not apply. I know already! However, the book - like all great works of art - isn't really about what it's about; Nicholls' writing is a witty, clever, and breezy read. It's only when you get to the book's remarkable postscript that you realize how difficult a trick that writing this book must have been to pull off. And, not to put too fine a point on it, the meaning of life itself. To reveal specific plot details is to spoil the book, so don't go reading any spoiler-filled reviews before you read it. When the book comes to North America, it will almost surely become a terrible Hollywood movie starring Julia Roberts and Jude Law, not to mention an Oprah book club pick, which will make impossible for anyone to enjoy or to revel in its surprises for the first time. Read it now or forever hold your peace. How much did it end up costing you with shipping!? I have only ever ordered one thing off the internet, so I am still kind of "fragile" when it comes to all this technical shopping. Let me know, I NEED to read this book! You can borrow mine for free! Or, if you want to own it, it's about $20, including shipping. And it comes out in softcover in February, I think. Can I really borrow yours!? Wow!! -- Since I am poor, and have a visa that was confiscated (for my own good, by good ol' ma) I will gladly take you up on that offer!! Thanks Kenton, you're the best! I am really very excited to read this book, it sounds really good! Of course you can borrow it! Sweet! -- I'm busy, and kind of a slow reader, so if I could borrow it for about a week or so, that would be perfect!! Thanks again, I'll take good care of it! I'm still trying to get over the idea that there's someone who doesn't read your blog! Oh, yes, that's me alright.